I own two blogs, one each for professional and personal blogging. The target audience for both blogs is entirely different. My poem blog www.vinaytosh.blogspot.com is on free domain and support Hindi fonts while my professional blog www.vinaytosh.com is more professional in look. When running multiple blogs, it’s important to have a clear separation from one blog to the next. Each blog should have a clear focus. Otherwise, how will you know which blog should contain a certain type of post? If you have several multi-topic blogs, you may find that some of them get neglected, or they suffer from poor quality content as you post on them just to keep them somewhat up to date. There’s very little reason to set up multiple blogs if you don’t have different things to say on each one. 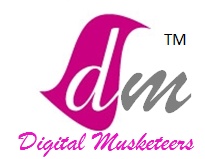 At Digital Musketeers we spend a lot of time in researching our clients need and maintain recency as well as frequency in our blog posts. Happy B'day Facebook Like Button! On 21st of April 2011 Facebook celebrated the one year anniversary of one of its most important product launches, the Like Button. To commemorate the one year anniversary of the Like Button Facebook released some interesting data about the button's usage in its first year. Process of Email Marketing ! I hope you are doing fine! It is start of financial year and every business was busy in making plans for next quarter and now it’s time for some real stuff. I hope this blog will help you in your day to day needs. In case you have any specific questions about online marketing you can always write me on Vinaytosh@gmail.com . Step 1: Define the objective of campaign as well as the target audience you want to tract. Step 2: Start from a much targeted list prepared by organic methods. To keep it simple:” Never buy an email list”. It won’t help in long run. Step 3: Ask for permission to collect email address and provide them unsubscribe option as well. Provided them freedom. If they don’t speak for you they will not speak against you as well. Step 4: Prepare a landing page with call to action for target audience. Step 5: Refine your campaign for people who have interacted. Step 6: Depending on second campaign pass the inbound leads to direct sales team. As a marketer you have spent few dollars on social media efforts and now time has come to show the results or at least management thinks so. To sustain your professional career as well as relevancy of your profile you need to show results and you don’t know how to measure it. Don’t worry; I am here to help you out. First of all, investment should never be made without having objective in mind. Define the objective and that should be aligned with business metrics. Now let’s accept the fact that Social Media is not a direct contributor to top line of business but it is enhancer. If we talk in term of AIDA model, Social Media plays a vital role till third step but purchase occurs through direct marketing or sales channel only. But you can analyze social media contribution using A/B split testing. A/B testing, split testing or bucket testing is a method of marketing testing by which a baseline control sample is compared to a variety of single-variable test samples in order to improve response rates. Before starting any social media campaign measure the initial state (of business metrics) and then measure it again at end of campaign the difference is result of social media campaign. In earlier section, I just talked about A/B Split testing or bucket testing. Now I am going to share six major buckets to examine. These are things such as leads, new email subscribers, sales and donations. You can create campaigns and see which links/posts to social sites are driving the most conversions. In social media, share of voice refers to the number of conversations about your brand vs. your competitors/market. To do this, you’ll want to use a monitoring program that can help you keep track of all conversations about your brand and your competitors over a given time period. When looking at all these mentions you’ll want to make sure to track which ones are positive, negative and neutral, so you can assign a weight to each of these categories and calculate your average sentiment. To get share of voice, you divide the number of conversations about your brand by the total number of conversations about brands in your market. Email opens and clicks complaints, etc. Don’t forget about email, as your participation on social sites can have a positive (or negative, if you’re doing it wrong) impact on your numbers here. I hope these buckets serve as helpful starting points for you. Keep checking our blog for more information about Social Media Marketing and Social Media Tools.